How do I Make Paper 45 Records? Make your own paper 45 records to use as decorations for retro-themed parties or dances. You can customize the 45 records to reflect musicians and artists from the time period and can make every record different or make a set of records that are all the same. 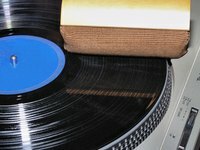 You can complete this project with children who could personalize their record with pictures and words and paint or color the 45 records to finish the project. Place a 45 record on top of a black piece of cardstock. Trace around the outside edge of the 45 record. Remove the record and cut around the circle. Draw a smaller circle on a piece of cardstock in the color of your choice. Use a drafting compass to draw a perfect circle or trace around a bowl, cup or another circular object. Cut out the circle. Using a hole punch, punch a hole in the center of the circle. Fix the smaller circle to the center of the circular piece of black cardstock using a glue stick or paste. Customize the 45 record using paint, crayons or markers. Write the name of your favorite artist and decorate the album in a retro style. Always supervise children making crafts with scissors.